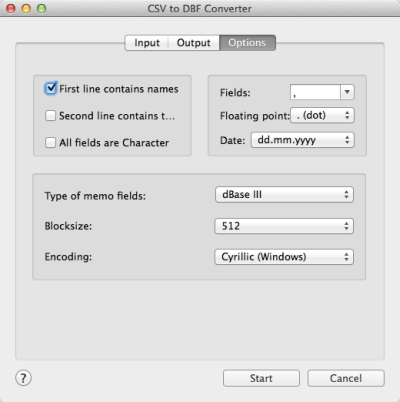 CSV to DBF Converter for Mac allows you to convert your csv (comma-separated value) files to dbf format. Besides, you can customize the output file, say select the output codepage etc. 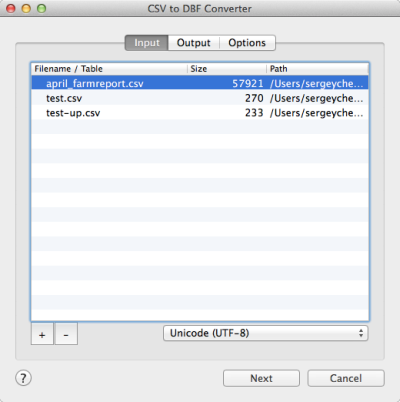 The program supports dBase III, dBase IV, FoxPro, VFP and dBase Level 7 formats. Since many programs can save data in CSV format then this programs can help you transfer these data to dBase or Foxpro files. The program supports command line interface. So, you can run it with necessary parameters in a batch mode from the command line or from scheduler without human beings.